Based on the South Coast at Shoreham Harbour. This is midway between Brighton and Worthing with very easy access from all directions. She is a well equipped Offshore 105 powered by a Cummins 400HP Turbo diesel and with all the modern electronics and necessary safety equipment for you to enjoy a days fishing. Licensed for 10 passengers and 2 crew. Start times are usually 07:30 or 08:30 and begin with the safety brief. The start and end time can easily be tailored if you require something different. I operate all year round. Weekends, weekdays and evenings. 2hr mackerel fishing in the summer months. Free tea and coffee supplied. 480 HP Turbo Diesel engine means less time travelling and more time fishing. Please call for more information on 07870 804852. Madeira is one of the worlds best angling locations. Lying some three hundred and sixty miles west of the coast of Africa, Madeira known as the floating garden is lush, fertile and tropical vacation paradise! Only a three hour air flight from the UK. Big blue marlin big eye tuna sword fish exceed world record sizes. The waters here see serious action year round. We can start fishing minutes after leaving the harbour as there as the depth drops off to one thousand metres very quickly. The warmer summer months bring in vast schools of skipjack tuna, dorado with monster marlin following the feast.We run two boats here from the pretty marina in Calheta. The boats are fully equipped with new 50/80/120 class tackle with state of the art electronics. The all-British crews all have full RYA certificates with many years of fishing here. We are able to offer unforgettable tailor-made fishing trips or package with a villa with pool. Maverick Adventure Fishing is based on the East Coast of South Africa, we specialize in guided tours for Land Based Sea Fishing, Fresh and Salt Water Fly Fishing and Deep Sea Fishing. In South Africa trips to venues such as Mazeppa Bay, Sodwana Bay, St Lucia and Kosi Bay are undertaken and an Angler can expect to do battle with Bull Sharks, Hammerhead Sharks, Giant Guitarfish, Butterfly Rays and a host of other characters, large and small. During travels we schedule visits to Traditional Villages and Game Parks so visitors can experience the culture and wild life diversity of South Africa. Trips to other African countries are organized, with Fly-Fishing for Tiger Fish at Cahorra Bassa in Mozambique being a unique experience. Inhaca Island, Mozambique, gives the Salt Water Fly-Fisherman a chance to test his skills against King Mackerel, Queen Fish, Sail Fish and the Tuna family. Maverick Adventure Fishing undertakes Fly-Fishing Trips to the Mountain Kingdom of Lesotho, where the pristine rivers, lakes and mountain streams are protected by the local Chief or community elder and the Village of Rhodes nestled in the Eastern Cape Highlands. The fishing is outstanding and some destinations are world class, on these trips Rainbow Trout, Smallmouth Yellow fish and Brown Trout are targeted. The guides that host these trips are top quality R.E.F.F.I.S. qualified guides. Maverick Adventure Fishing is taking adventure fishing to a new level, trips are being planned in 2012 to paddle around Zanzibar Island in 21 days kayak fishing, 14 days Land Based Sea Fishing trip to fish the 40km coastline of the Democratic Republic of Congo, 14 Days Fly Fishing in Siberia and a 14 day trip to fish for Goliath Tiger on the Congo River (should you be interested in any of these trips please contact us at info@maverickadventurefishing.com). Fish are affected by mother nature and adverse weather conditions so we cannot promise that fish will co-operate all the time, but our promise to you is that we will do all we can to make your trip enjoyable and a success. 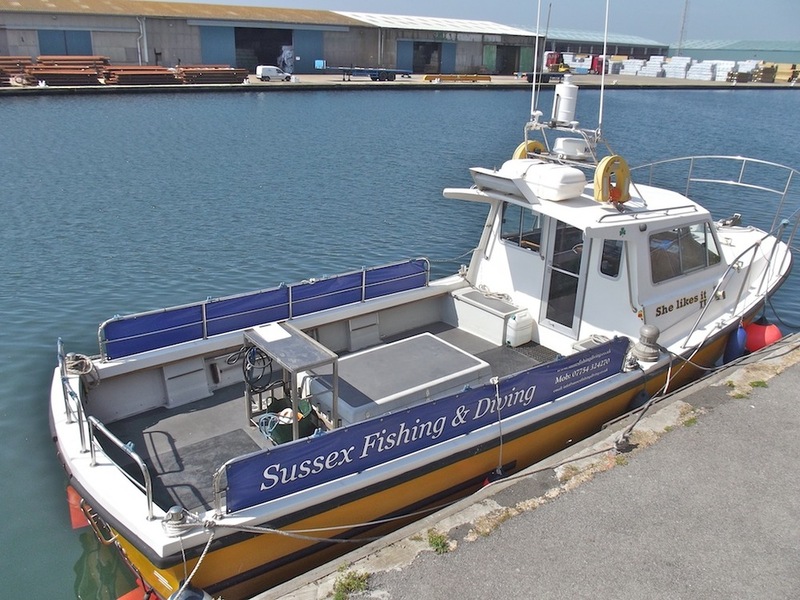 We run two charter fishing vessels, both operating from Dover Marina. The 38ft Royal Charlotte is skippered by Mick Coker, and the 36ft Portia is skippered by Matthew Coker. Both boats operate 7 days a week, all year round, and are licensed and insured for 12 persons. We cater for groups and individuals and can supply all rods, tackle and bait if required. We can also cater for joint bookings such as corporate days up to 24 anglers and competition days between the two boats. The price is £40 per person and this includes rods and tackle, this is for a full day charter (8hrs). The whole boat can be hired for £320 upto 8 people, and £40pp upto 12. There are many species of fish we catch from Dover through the seasons, these are Cod most of the year, Bass, Plaice, Turbot, Pollock, Bream, Mackerel, Whiting, Skate, Blonde Ray and Dogfish. 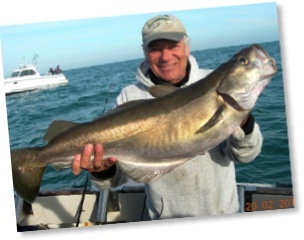 Mick has 40 years experience, fishing Dungeness, Folkestone and Dover areas. Mick and Matthew both fish the Varne, Ridge and Goodwin sandbanks, mid channel wrecks and the french coast. Mick is the 3rd generation of fisherman, his father being a trawlerman who moved over to charter fishing seeing the increasing popularity of sport fishing. Matthew is now the 4th generation starting out with his grandfather and now skippers his own boat Portia. Both vessels carry the latest navigation and fish finding equipment, and are in constant communication with each other, increasing there scope of fish finding capabilities and safety. The Royal Charlotte is purpose built for charter angling designed and skippered by Mick Coker, the vessel is 38ft long (11m), 14ft beam and weighs 19 tons, and being deep draft means she drifts square with the tide making fishing very pleasant with less tangles. The Portia is also a heavy built displacement fishing vessel, 36ft long with 21 feet of room behind the wheelhouse, comfortable for fishing, with plenty of seating, also purpose built for charter fishing. Both boats are fully insured and licensed for 12. Both boats can be hired for competitions and corporate events, also film work and scattering of ashes. Fish gutted, cleaned, and bagged if required. On board toilet, Spray Covers and clean water fish wash. The largest shore-caught fish along the North Wales coast come from the rocky stretch at Old Colwyn. This is a great spot for conger eels, lively bass and used to have a reputation for tope. The downside is a lack of cover from the prevailing onshore wind, though a good north-westerly creates a chop on the sea and the fish seem to feed with more confidence. Easy access is available from the promenade at Colwyn Bay and in summer it is a lovely walk to the Head or you can walk through the old quarry below the former 70 Degrees Hotel. Local beach anglers look upon the rocky shoreline as a prime winter fishery for congers, quality whiting and s mall codling. Those conger - to 20lb and more – are catchable throughout the year, while from May through until October there is a good run of bass, with fish to 7lb along this particular part of the coast. Use peeler crabs for bass. A fresh mackerel flapper a high water is ideal for the mature conger eels. Dusk is the time for catching the bigger bass and also offers a chance of picking up a thornback ray. The standard bass rig is a size 4/0 Pennell with a metre-long trace (just enough to give some movement) coupled with a rolling lead. A 5oz lead is the heaviest needed and your line should be around 15lb. A stout beachcaster with 30lb line and a metre-long 100-150lb trace is recommended and the bait is a mackerel on a size 6/0 hook. Short casts produce the largest share of fish and a gentle lob will put the bait between the boulders where the eels and bass forage. The straightforward route is to drive along Colwyn Bay Promenade (with the sea on your left) to the end. Park and walk along the footpath above the rocky shoreline. Fish are likely to appear anywhere, though the Head rock is probably the most popular spot. Bay View Angling, 12 Greenfield Rd, Colwyn Bay, tel: 01492 535888. Victoria Pier Angling, The Promenade, Colwyn Bay, tel: 01492 530663. Times from 09.00 to 16.30. Times from 17.30 to 20.30. All trips subject to weather permitting. The boat is a fast 33' Aquastar, with twin turbo diesels and has been built to fulfil all angling needs. She is fully loaded with all equipment to cater for any persons' need, being experienced or novice. The equipment on board complies to all of the latest safety standards and licensing schemes produced by the States of Jersey Harbours. Tony the skipper has become one of the only charter skippers to hold a British Record for the largest ‘Ballan Wrasse’ ever recorded on rod and line, a fish of 9lbs 7oz 12drms. During Tony's 19 years as a professional charter boat operator, no less than eleven record fish have been caught while he was skipper. Both boats are licensed for 10+2 and cater for experienced anglers or beginners with tuition given by a member of the Welsh National Boat Fishing Squad. All trips are from 4 to 12 hours, all trips 8 hours and over are provided with breakfast and lunch, usually Sausage and egg butties for breakfast (made fresh whilst you are fishing) and hotpot or curry for lunch (everyone has to have the same), we can provide a vegetarian option if necessary. Mel - Has been fully qualified as a charter skipper for the last 16 years and has a vast knowledge of the local area. Aaron- Has just qualified as a skipper which makes him the youngest in the UK. Aaron fishes for the Welsh National Boat Squad and is on Trearddur Bay Lifeboat crew. If you wish to hire the boat for divers please feel free to give us a call and I am sure we could be of service to you. We also have a bunkhouse that sleeps 10 persons and unbeatable rates. 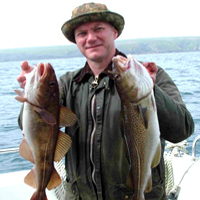 Skipper Joe Lynch is a former Naval Officer with 23 year’s experience, and Sea Angling for the last 12 years. A Live bait well is there to keep your bait in good condition, and the rods and reels are all top quality Daiwa, including Daiwa PLB 20, Daiwa PLB 50 and Team Daiwa 3050R Rods, with Daiwa SeaLine 30SH, and SHV40 reels on the lighter rods and SeaLine 300H, 400H, and 600H Reels for the heavy going. I always carry a comprehensive range of tackle, to suit most conditions. The Rod table and Bait board is located centrally over the live well, Please note, cutting bait on my white GRP gunwales is a walk-home offence! Wreck Hunter is a new custom built Wildcat 107 Catamaran from Safehaven Marine, Cobh \. She has twin 370Hp Yanmar Diesels (up to 27.5 knots max! ), a huge amount of rail and deck space, and a wide band of economic hull speeds. She has superb Sea keeping qualities, as the Cat hull form gives impressive stability, deck space, and speed, with no slamming, and very little spray, even at speed, due to the symmetric twin hull design. Angling on the Drift, and at Anchor, you will not believe how comfortable the boat is to fish from. I recommend the Compass Rose Guest house (pictured) which is 400m from the Marina. (Separate deposit required). Sea Hunter is available for a complete range of services as follows. Based between Ballycotton and Dungarvan with easy access to the open sea at all states of tide. This area is lapped by the Gulf Stream and excellent fishing is had. Especially wreck fishing, which numbers 38+ within a 30 mile radius of Youghal Harbour most from WWI and WWII. Seahunter covers some very productive rough ground from Ballycotton Island to off Mine Head this ranges from 20mtrs depth to 45mtrs with some pinnacles coming up to 13mtrs from 32mtrs here you have good mixed fishing on the drift inc: Tub, Gurnard, Grey Gurnard, Red Gurnard, Pollack, Cod, Ling, Pouting, Garfish, Dogfish, Coalies, Conger and in the flat bottom off to the south produces nice whiting. Bait: We use mainly Mackerel as its always a good fresh bait and plentiful in supply but rag, lug and crab can be got at local tackle supply store. Rods and reels are supplied for hire at 10 euro pp per day inc lead and some traces, for a good day at sea bring plenty of terminal tackle traces as you will lose gear on the wrecks and rough ground. We always have a good stock of feathers and traces on board at cost price and will show you how to set your gear up and fish it properly, so if you’re a beginner help is always at hand! “seahunter” is a 42ft interceptor with 13.5ft beam hard boat, new in 2007 making her one of the largest vessels in her class. marks with minimum of fuss and in comfort. Sea Hunter is D.O.M approved and licensed for 12passengers and 2crew with fully qualified skippers to D.O.M regulations. And fully insured. Sea Hunter” is available for a complete range of services as follows. John Webster is the proud owner and skipper of charter boat Venture, a 10 metre Cornish built wooden charter boat with loads of desk space and a cabin. She is licensed for 12 anglers and there is ample room for your tackle and sandwiches. Venture is also fitted with a toilet. Venture is licensed for use up to 20 miles from port and is fitted with all the safety equipment needed including Life Jackets, First Aid Kit, Life Raft, Fire Extinguishers and 2 VHF radios. To find the fish we have the latest navigation equipment including GPS Plotter and Colour Fish Finder. John has been sea fishing, fly fishing and coarse fishing for over 50 years and has been lucky enough to turn his hobby into a living! The fishing charter boat skipper is a keen angler himself, and his favourite species is the legendary Bass! However, John also loves ground fishing and loves the expectation of what he is going to catch next! Charter boat Venture is ideal for all type’s of fishing as she has a large desk space and is very stable at anchor. Charter skipper John has caught many double figure fish including a monster 28lb Cod aboard his previous large charter boat, Kingfisher. John is also known to find plenty of Mackerel and a few Skate, Tope and Black Bream along the way! 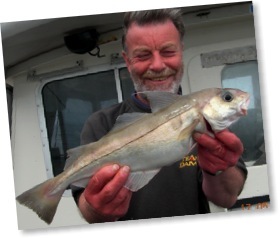 Charter boat skipper John enjoys sharing his many years of sea angling experience assisting those new to sea fishing, juniors, ladies and those a little older. The skipper is also delighted to learn from more experienced sea anglers! 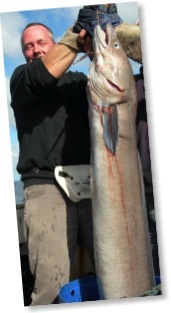 Newhaven charter fishing boat Venture is suitable for all types of boat sea fishing trips. Venture is available for both Ground fishing and in season Bass fishing. Venture is ideally suited to this type of fishing due to her design. She sits very comfortably at anchor and there is seating on both sides for everyone, thus allowing you to fish in some comfort. Venture can be hired for all types of sea angling including Sea Bass boat trips, deep sea ground fishing and Mackerel boat fishing trips. For full information on each of these different types of boat trips that Venture can be hired for, please click on the link above which will take you to our website. Ground fishing is the perfect choice for those wanting to catch monster Cod during the winter months or who wish to target species such as Skate, Tope, Conger Eel, Smoothound plus the many more that are found off the Sussex coast. The most effective method for ground fishing is the use of dead baits such as Mackerel and Squid and placing on a one or two hook rig. If in doubt charter skipper John will be only too happy to offer assistance. If required, charter boat skipper John is able to hire you the latest rods and reels which are perfect for ground fishing. For further information about the rods and reels for hire aboard Venture, please click here. These fishing boat trips last 2 hours & are great for those wanting to do a spot of boat fishing & go home with fish! Mackerel fishing is really exciting, and when you hit a shoal of Mackerel the water looks as though it is boiling as there are so many! These trips are especially ideal for those with children who wish to introduce them to the world of sea fishing. Charter skipper John will be on hand to assist novices, children and women the techniques to catch their first Mackerel. Our Mackerel fishing trips are seasonal due to the Mackerel preferring the warmer water. The best times of the year are the months of May through to September. The cost of the two hour Mackerel fishing trip aboard Newhaven Charter boat Venture is £20 per person. Non anglers are welcome but the cost is the same. Rods and reels can be loaned at no extra charge. The minimum number of people per trip is four and the maximum is ten. To book a Mackerel fishing trip please visit our website. Venture is fitted with a live bait tank, suitable for keeping line caught Mackerel in perfect condition for live baiting, which as we all know is the No 1 method for catching the Sea Bass. However, other popular methods for catching Sea Bass is the use of soft lures Shads, Red Gills and Jelly Worms plus the many different types of hard bait lures on the market today. Here in South West Ireland, Inches House and Boat Angling Centre offers you 3 well appointed self-catering cottages. Set at the foot of the Slieve Miskish mountain range on a quiet country lane on the beautiful Beara peninsula, West Cork. The Cottages are situated approximately 1km from Eyeries village and 1.5km from the Atlantic Ocean. The busy fishing port of Castletownbere is approximately 5.5km from Inches House Cottages. There are a selection of supermarkets, pubs, cafes and restaurants. It is also the home of McCarthy’s bar as featured in the book of the same name written by the late Pete McCarthy. The Ring of Beara is a scenic coastal driving route around the finger-like Beara peninsula which projects South West into the Atlantic Ocean. Whilst motoring, walking or cycling you have ever-changing mountain and sea views extending to the Ring of Kerry in the North and the Sheeps Head and Mizen Peninsulas in West Cork to the South. Our boat 'Tigger' is a 9.5m procharter offshore angling vessel. It has a licence to operate a maximum of 30 miles from Castletownbere with up to 10 anglers. Tigger has a top speed of 26 knots and a cruising speed of 16 knots so it doesn’t take long to travel to great fishing grounds. Onboard facilities include: toilet (accessible from the main deck), rod holders, live bait well, tea/coffee making facilities and the latest simrad and Humminbird navigational aids. Notable catches aboard Tigger in the last few years include: ling to 43lb, pollack to 16.5lb, coalfish to 20lb, cod to 20lb, conger to 55lb, haddock to 7lb, whiting to 3.5lb, ray to 17lb, plaice to 4lb, brill to 4lb, bass to 7lb, blue shark to 150lb, triggerfish to 2.75lb, red mullet to 1lb 2oz and many others. There is some excellent Game Fishing in Counties Cork and Kerry for salmon, sea trout , rainbow trout and brown trout. Both counties abound with mountain lakes and these are truly spectacular in regard to scenery and angling. There are several stocked rainbow trout lakes within an hours drive of Inches House Cottages. Boats are available for hire at these sites. In general salmon and sea trout fishing can start as early as January 17th and can continue until the end of September. There are at least 5 spate salmon/sea trout rivers within one hour of us and of course there is the world renowned Lough Currane system for exceptional sea trout fishing not far away from us on the ring of Kerry. Situated less than a mile from the Kincardine bridge this mark offers reliable estuary sport in summer. Flounders and eels make up the bulk of the bags, but occasional codling and school bass can make a welcome addition. Best bet would be to start over low water as this will give a good view of gullies and features that the fish will follow as the tide floods. The season runs from May to October with sport peaking around July or August. Flounders will be caught at close range out of the tide run, which can be fierce on bigger tides or following a rainy spell. Eels are caught a little further out on the edge of the tide where an anchored rig will be best fished by your watch rather than for bites, which can be hard to detect because the tide holds the rod well bent. Peeler crabs are undoubtedly best, but ragworms and fish strip can be useful additions. Very few snags mean that standard gear will suffice. Some use a lighter flattie rod for close range and a stiffer more powerful beachcaster to help with distance and the 6oz or 7oz lead needed to hold in the main flow. A 6500 or 525 type reel is best. Use 18lb line because this gives extra security should weed or debris become a problem. Rigs are a standard two-up, one-down fl aping with size 2 crab hooks. Clipped rigs are handy when the tide drops and the main channel becomes harder to hit. Take the fi rst left off the Kincardine bridge (A876) going north leading onto a lane with a handy car park at the end that overlooks the river. Do not park in the lower area because this becomes flooded on bigger tides or spates. Stirling Angling Centre, Calquhoun St, Stirling, tel: 01786 430400. Frinton wall was once a Mecca for anglers seeking big bags of whiting and codling. Unfortunately that’s a thing of the past because the new sea defences, made from car-size rocks, make this once prolific mark almost unfishable. All is not lost because the stretch between the golf club and Burnt House groyne, towards Walton, offers high-calibre sport. The sea bed consists of hard sand leading onto clay, which is uncovered on spring tides. Best action occurs two-and-a-half hours either side of high water, with an ebb favoured for codling and whiting in winter. Those with the ability to place three baits a long way catch the most fish. March and April offer spring codling, which are followed by eels. 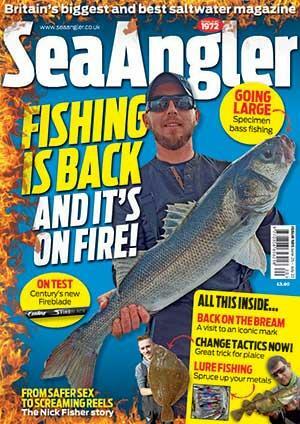 Bass arrive in May, with the biggest caught during autumn gales. This is a prime location for catching some stingray in May and into June. The first big tides in August can bring smoothhound inshore hunting for hermit crabs, but they only come within casting range for several tides. September to Christmas produces whiting, pouting and codling. The latter peak in November and December on evening ebb tides. The first codling prefer peeler crabs, with lugworms and white rag a close second. Eels take peelers. Stingray feed an hour either side of high water on crabs or king rag; smoothhound take the same baits. Whiting fall to lug tipped with squid or mackerel. Tipping with squid head or sandeel chunks can tempt bigger whiting. Crabs are better than lug for codling in September and October, but, when this runs out, use big helpings of lug and squid. This low, flat area often requires maximum distance on ebb tides. Use 12-13ft match rods, 6500-size reels with lines from 0.32-0.35mm. A Bimini twist shockleader knot is advised for extra confidence when pulling rigs out of the mud. Use a 150-175g breakout lead weight. Three-hook flapping rigs with 9in traces and light size 1 hooks take maximum numbers of whiting and codling. Wishbone rigs give extra distance, if required. A Bomber rig is better on the ebb and the longer snood should carry a big bait for codling. Summer sport requires an increase in snood lengths, with one-up, onedown rigs and size 1/0-2/0 Kamasan hooks favoured for stingray. From the A12, take the A120 turning past Colchester. Turn onto the A133 for Clacton, Walton and Frinton. At the Weeley roundabout take the A1033 passing through Thorpe, then Kirby. Turn right over the crossing at the junction of Frinton railway gates and this road passes along Connaught Avenue and onto the seafront. Parking is free along the greensward. Metcalf’s, 15 Newgate St, Walton on the Naze, tel: 01255 675680. Stenhouse trout fishery is a 35 acre loch which is set in a scenic rural location with spectacular views. Sited two miles north of Burntisland on the A909, this loch is convenient for all the major urban areas of Fife and beyond, and also for the major holiday resort of Kinghorn. For a period of 90 years, the loch was part of the Fife water supply system until it was decommissioned in the 1990's. Wading is popular and fruitful, the best areas being the Dam Wall and the South Shore. The North Shore has seen a dramatic improvement in recent years, and is well worth a go! The loch is full of aquatic food items for the fish which promotes a high growth rate. Sedge larvae, midge, caenis, shrimp and snails - and hatches can be spectacular. At such times, being afloat and mobile offers the best opportunities. Stenhouse is regularly stocked with high quality Rainbow trout weighing between two and six lbs, although double figure fish are also stocked regularly. Additionally, the loch contains native brown trout, averaging between 2 – 6 lbs. It is not unknown for a catch to be in double figures. Fishing is by fly only, from both bank and boat. The loch is open all year round, weather conditions permitting. Lady of the Lake is owned by Excalibur Sea Charters based on the south coast in Brighton Marina in East Sussex. Lady of the Lake is a sports fishing cruiser 42ft x 13ft 6in, working deck is 18ft x 13ft with two 6 seater tables on the deck. She has a good array of electronics, 2 radars, 2 G.P.S., 2 sounders, 1 plotter/g.p.s and 3 V.H.F. Have an inside working toilet, working galley, and seating for 12 in the forward cabin, and 4/5 in the wheelhouse. Powered by 2 x 370 hp Iveco engines. The boat is licenced for 12 people plus 2 crew, with code of practice up to 60 miles, fully insured with all safety equipment necessary for coding. We operate all year, weekends, weekdays and evenings. Wreck, ground and reef fishing 8hr, 4hr, 2hr trips.